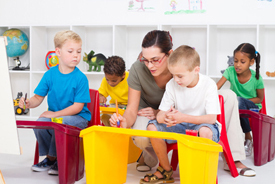 Out and About: Encouraging Speech and Language Development with Your Young Child at the Playground, the Pool, Art Class, the Grocery Store … - Boston Speech Language Therapy in Brookline, MA 02445. Parents are busy people. Every hour seems to be filled with the mechanics of daily life (going to work, paying bills, taking out the trash . . . ), plus all of the activities that are part of being a parent. 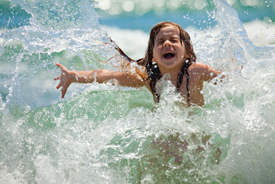 Parents bring their children to the grocery store, play with them at the playground, teach them to swim at the pool or lake or beach, bring them to art class or gymnastics class or music class, oversee playdates . . . So who has time to do all this AND support the speech and language development of their young child (ages 0-3)? The good news is that you can encourage your child’s speech and language development wherever you are with your little one. 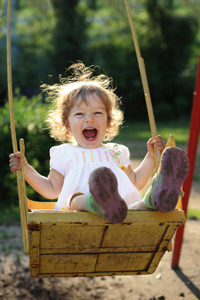 You can turn any location into your child’s speech and language classroom, and have fun while you’re at it. Art Class: Many children love to explore art materials such as paint, glue, paper, glitter, and markers. Attending an art class at your local library or community center provides the perfect opportunity to explore language about how things feel. Language learning is enhanced through a multi-sensory approach, and art materials are an excellent way to incorporate tactile vocabulary into your child’s repertoire. The paint is “wet.” Later it will be “dry.” Is it “warm” or “cold”? Is the glue “sticky”? Is the cardboard “rough” or “smooth”? You can call your child’s attention to these words and more as you playfully repeat them while you’re creating masterpieces. For example, you might make a little rhyme: “This paint is wet. How wet can it get? The paint is wet, it’s wet, wet, wet!” Or: “Sticky, sticky, sticky glue, sticky, sticky, sticky glue, sticky, sticky, sticky glue – now it’s stuck on you!” Using varying pitch and volume, and throwing in some silly faces, will help maintain your child’s interest, highlight your target words, and generate fun for both of you. Grocery store: You ran out of milk. Again. 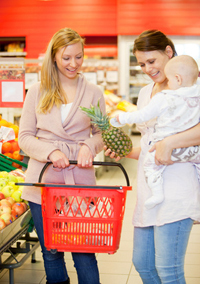 Now you’re making another trip to the grocery store with your toddler in tow. It’s ok, though. You can get all of her senses involved - seeing, hearing, smelling, tasting, and touching – and boost her descriptive language while you get your shopping done. Are the shopping cart’s wheels “squeaky”? Do the peaches smell “sweet”? How about the potato chip samples – are they “crunchy”? Are the apples “shiny” or “red” or “green”? In addition to providing so many great opportunities to teach descriptive words, the grocery store is hard to beat for teaching single-word vocabulary for food items. You could spend hours in the produce department alone, labeling everything from apples to zucchini. Remember to provide lots of models and repetition, and to keep it fun! Don’t put too much pressure your child to perform – if she repeats after you when you say “shiny,” great. Take turns saying it while you look at all those shiny apples. And if she doesn’t do it this time, there’s always the next time you forget the milk. Music Class: Lots of children love music – singing, dancing, banging drums, shaking maracas and tambourines – making music can be a noisy, fun activity. And it can also be a great context in which to foster language development for your child. The next time you sing “The Wheels on the Bus” with your little one, encourage him to fill in a word. After you sing “The wheels on the ___,” insert a pause, so he can sing “bus.” Once he says it, continue the song, perhaps pausing again for him to fill in “round and ______.” You’ll want to use a song that’s familiar and motivating to your child, to maximize his ability to fill in the target words. One mother reports singing “Rudolph the Red-Nosed Reindeer” to her one-year-old over and over in July, because that was his favorite song, so he was eager to help sing it. As your child becomes more accustomed to the expectations of the activity, and more able to produce a variety of words, he can fill in more of the song. As you can see, you really can incorporate language play into your day in myriad ways, in any location, so you’re having fun and fostering your child’s language development wherever you are.